Here are some pictures of the mic holder that I built. After getting a quote on the original mic holder from Sony I sat back, got creative and went through some items in my house to see if there was something that could, with some slight modification, be used to build a mic holder. Here's what I found: The silver plate comes from my radio controlled car (Ofna Super Pirate) - it holds the centre diff together. 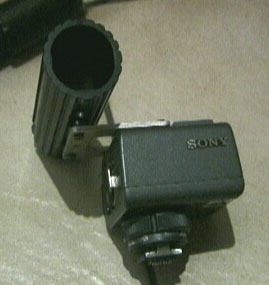 The black pipe is part of a holder for an old shotgun mic used for my Super8 film camera. The amazing thing is that the distance between the holes in both items matches the distance of the two screws for the mic holder on the XLR adapter. 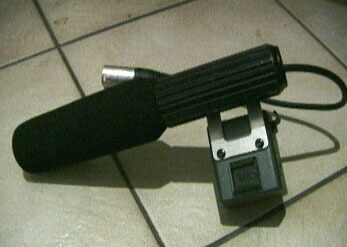 I wraped the back end of the mic in foam and tied it together with gaffer tape. This way the mic just slides into the pipe and supports itself. My suggestion is to get someone to cut you a plate out of aluminium or PVC; and get a piece of pipe slightly larger than the mic. 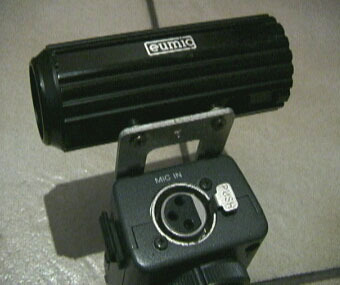 You will have to wrap the mic in foam or something like that to avoid noise from the camera filtering through.